Brydges Place, WC2, 1982. Photo © Paul Barkshire. 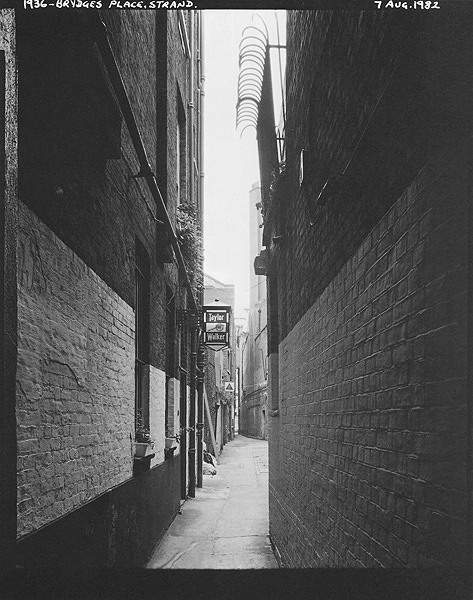 Brydges Place – “the narrowest alley in London” – runs between St. Martin’s Lane and Bedfordbury. Paul Barkshire’s photograph shows the view towards St.Martin’s Lane, where the alley narrows with an authentically Victorian oppressiveness before it opens out into the bright lights next to the Coliseum. Ahead, the pub signs denote the back doors of The Marquis and The Harp, the latter being one of the nicest remaining West End pubs; immediately behind where Paul placed his camera is 2 Brydges Place, a civilized drinking club which, like the Harp, is much favoured by actors and theatre people. This Dickensian little alley – a relic of a time when London was interlaced with innumerable such passages, usually forbidding rather than charming – offers many possibilities for drinking, socialising and making odd connections in general. On a warm night, or just when the pubs are so rammed that they spill into the alley, one can strike up intriguing conversations with strangers. And the stars are more vivid when you can only see a narrow slit of sky (past the sodium yellow of the streetlights, of course). It is also a good spot to make a fool of yourself. Your correspondent went to English National Opera at the Coliseum earlier this year, and after a couple of sharpeners at the Harp, used Brydges Place as a cut-through – forgetting how crowded it gets on a Saturday when there is a matinee at ENO. As I trundled towards St.Martin’s Lane, I noticed a very beautiful woman waiting for me to clear so she and her friend could enter the alley: I recognised her as being the celebrated actress Saffron Burrows. No sooner had I clocked her and her cheekbones than I heard her say to her companion: “We’ll have to wait for this large man to get out before we can go down here”. A fraction of a second later, I stepped on a loose paving slab and my desert-booted foot dropped into filthy rainwater up to my ankle. Smooth, smooth, smooth. D.S.